Muhammad Qadri Dalal (b. 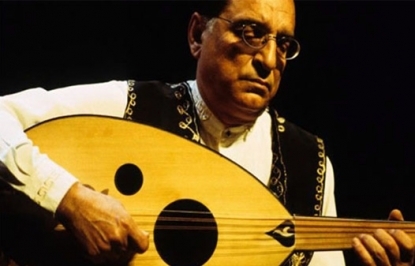 1946, Aleppo) is one of the last true masters of improvisation in Arab music. Raised in the rich musical ambiance of Aleppo, Syria, Dalal from a young age was schooled in the complexities of Arab music and acquired an unparalleled mastery of its modal and rhythmic systems. He studied oud and Arab music theory with the master musician Bakri al-Kurdi, and also learned the viola, contrabass, and violin. Dalal has performed to wide acclaim as a soloist, ensemble member, and leader in Syria, across the Arab world, and around the globe. He has worked with many of the leading artists in Syria, including Sabah Fakhri, Sabri Moudallal, and others. Dalal is also a skilled arranger, composer, teacher, and scholar of Arab music. His recordings include: Syria, Aleppo: Improvisations (winner of the Grand Prize of the Charles Cros Academy, 1988); Maqamat Insolites / Rares Modes (INEDIT, 2002); among others. He is the author of a number of books on Arab music, including an oud method, and is a prolific composer of instrumental and vocal pieces. Formerly the director of the Arab Conservatory and the Sabah Fakhri Conservatory in Aleppo, he is currently professor of oud, Oriental violin, and Arab music theory at the Conservatory of Music in Alexandria, Egypt. He resides part of the year in New Jersey, where he gives private lessons. This event satisfies the World Music requirement for undergraduate Boyer College students.